Whey Protein Concentrate, Milk Protein Isolate, Non-Dairy Creamer (Sunflower Oil, Corn Syrup Solids, Sodium Caseinate (milk), Mono- and Diglycerides, Dipotassium Phosphate, Tricalcium Phosphate, Soy Lecithin, Tocopherols), Dutched Cocoa, Natural & Artificial Flavors, Polydextrose, Fibersol-2 Fiber, Vitamin & Mineral Blend (Di-Calcium Phosphate, Magnesium Oxide, Ascorbic Acid, Vitamin E Acetate, Niacinamide, Electrolytic Iron, Zinc Oxide, D-Calcium Pantothenate, Pyridoxine Hydrochloride, Copper Gluconate, Riboflavin, Vitamin A Acetate, Thiamin Mononitrate, Folic Acid, Potassium Iodide, Cyanocobalamin), Cellulose Gum, Salt, Medium-Chain Triglycerides, Acesulfame Potassium, Sucralose. As a nutritional supplement, replace 1 daily meal with a serving. Use 10 oz. of water or your favorite beverage. 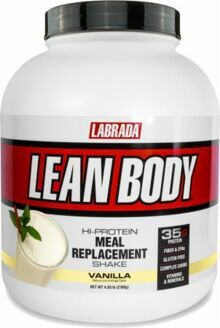 Add 2 scoops (70g) of Lean Body and mix in a blender or shaker. To build muscle, add 1-2 servings to your daily food intake. LeanPro® (Cross Flow Micro Ultrafiltered Whey Protein Concentrate, Milk Protein Isolate, Cross Flow Micro Ultrafiltered Whey Protein Isolate, Glutamine Peptides), EFA Plex™ (Sunflower Oil, Creamer [High Oleic Sunflower Oil, Corn Syrup Solids, Sodium Caseinate, Mono and Diglycerides, Dipotassium Phosphate, Tricalcium Phosphate, Soy Lecithin, Tocopherols], MCT Oil, Flaxseed Oil, Borage Oil), Fiber Plex™ (Polydextrose, Fibersol 2 Fiber, Cellulose Gum, Oat Flour, Rice Bran), Natural and Artificial Flavors, Vitamin & Mineral Blend (Di-Calcium Phosphate, Magnesium Oxide, Ascorbic Acid, Vitamin E Acetate, Niacinamide, Electrolytic Iron, Zinc Oxide, D-Calcium Pantothenate, Pyridoxine Hydrochloride, Copper Gluconate, Riboflavin, Vitamin A Acetate, Thiamin Mononitrate, Folic Acid, Potassium Iodide, Cyanocobalamin), Fructose, Salt, Sucralose, Acesulfame Potassium. Contains Milk, Soy (lecithin). Note: Soy lecithin helps the Lean Body® powder to dissolve in water. LeanPro (Cross flow micro ultrafiltered whey protein concentrate, soy protein isolate, cross flow micro ultrafiltered whey protein isolate, milk protein isolate, glutamine peptides), EFA Plex (sunflower oil, corn syrup solids, sodium caseinate, mono and diglycerides, dipotassium phosphate, tricalcium phosphate, soy lecithin, MCT oil, flaxseed oil, borage oil), cocoa, fiber plex (polydextrose, fibersol 2 fiber, cellulose gum, oat flour, rice bran), natural and artificial flavors, salt, acesulfame potassium, sucralose. LeanPro® (Cross Flow Micro Ultrafiltered Whey Protein Concentrate, Cross Flow Micro Ultrafiltered Whey Protein Isolate, Milk Protein Isolate, Glutamine Peptides), EFA Plex™ (Sunflower Oil, Creamer [High Oleic Sunflower Oil, Corn Syrup Solids, Sodium Caseinate, Mono- And Diglycerides, Dipotassium Phosphate, Tricalcium Phosphate, Soy Lecithin, Tocopherols], MCT Oil, Flaxseed Oil, Borage Oil), Fiber Plex™ (Polydextrose, Fibersol 2 Fiber, Cellulose Gum, Oat Flour, Rice Bran), Natural And Artificial Flavors, Vitamin & Mineral Blend (Di-Calcium Phosphate, Magnesium Oxide, Ascorbic Acid, Vitamin E Acetate, Niacinamide, Electrolytic Iron, Zinc Oxide, D-Calcium Pantothenate, Pyridoxine Hydrochloride, Copper Gluconate, Riboflavin, Vitamin A Acetate, Thiamine Mononitrate, Folic Acid, Potassium Iodide, Cyanocobalamin), Beet Juice Powder, Salt, Sucralose, Acesulfame Potassium. LeanPro® (Cross Flow Micro Ultrafiltered Whey Protein Concentrate, Cross Flow Micro Ultrafiltered Whey Protein Isolate, Milk Protein Isolate, Glutamine Peptides), EFA Plex™ (Sunflower Oil, Creamer [High Oleic Sunflower Oil, Corn Syrup Solids, Sodium Caseinate, Mono- And Diglycerides, Dipotassium Phosphate, Tricalcium Phosphate, Soy Lecithin, Tocopherols], MCT Oil, Flaxseed Oil, Borage Oil), Fiber Plex™ (Polydextrose, Fibersol 2 Fiber, Cellulose Gum, Oat Flour, Rice Bran), Natural And Artificial Flavors, Vitamin & Mineral Blend (Di-Calcium Phosphate, Magnesium Oxide, Ascorbic Acid, Vitamin E Acetate, Niacinamide, Electrolytic Iron, Zinc Oxide, D-Calcium Pantothenate, Pyridoxine Hydrochloride, Copper Gluconate, Riboflavin, Vitamin A Acetate, Thiamine Mononitrate, Folic Acid, Potassium Iodide, Cyanocobalamin), Fructose, Salt, Sucralose, Acesulfame Potassium.